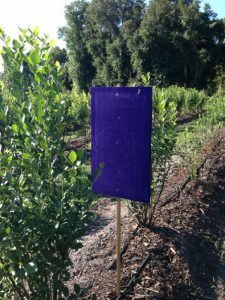 Since 2014, several Florida blueberry growers reported visible tunneling on the canes of their blueberry bushes. 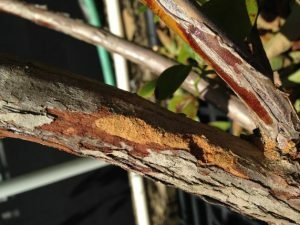 In the summer of 2016, the University of Florida Fruit and Vegetable IPM Laboratory found a flatheaded borer larva feeding on wood under the bark of a blueberry bush submitted to the lab by a local grower (Fig. 1). A survey of blueberry farms in central and north central Florida found tunnels in bushes on 9 out of 10 farms surveyed. We collected and maintained infested bushes in a shade house in hopes of rearing out adult beetles for species identification. In February 2017, we identified a beetle as belonging to the Chrysobothris femorata species group (Fig. 2). Chrysobothris femorata, the Flatheaded Appletree Borer (FHATB), is one of the species in the group and is a pest of apples and many other hardwood trees in FL and the southeastern US. Fig 1. Flatheaded borer larva. Fig. 2 Adult female Chrysobothris femorata (species complex). Female beetles lay their eggs in protected crevices on the bark of host trees throughout the summer. Eggs hatch in about 7 days and larvae feed on wood under the bark. 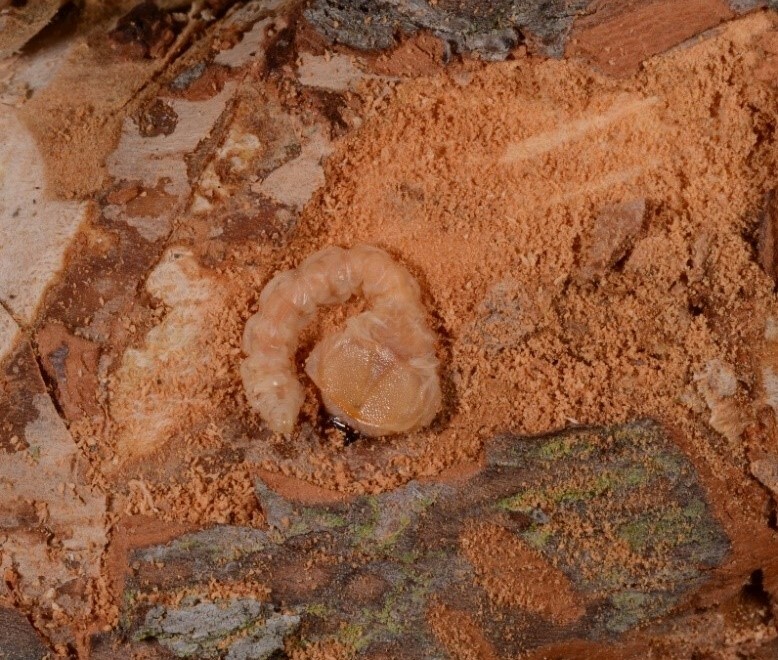 Larvae create tunnels filled with frass (larval feces) under the bark of the tree, causing the bark to be “pushed up” along the path of the tunnel (Fig. 3). Feeding continues throughout the summer, fall and winter months. Larvae pupate inside the cane for 1-2 weeks before emerging as adults. Beetles collected from blueberries have been identified as the C. femorata species complex and could have a life cycle similar to FHATB, but the exact details are not yet known. Fig 3. Active tunnel from flatheaded borer larva. Purple panel traps attract adult beetles during late spring through fall. Purple panels of corrugated plastic are attached to a wooden stake and coated with a sticky glue, such as Tanglefoot (Fig. 4). 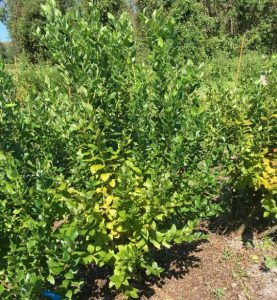 Sampling for larval infestations is done during the summer and fall months by inspecting blueberry canes for new borer damage. 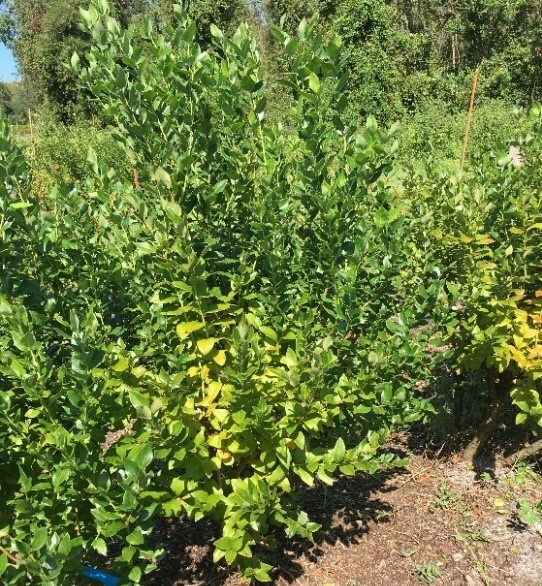 In late summer, infested blueberry canes may show signs of leaf chlorosis (yellowing of the leaves) (Fig. 5). Disease symptoms are often present on infested bushes. 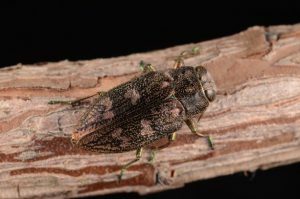 Wood boring beetles attack trees that are already stressed. It is possible that the flatheaded borer is attracted to diseased bushes. Alternatively, the injury caused by the beetle could make bushes more susceptible to disease. Fig 4. Purple panel trap to monitor for adult flatheaded borer. Fig 5. Infested cane with yellowing leaves. Systemic insecticides kill developing larvae. Pruning and removal of infested canes is a cultural control option and the only option for organic growers currently. The beetle attacks bushes stressed by diseases or other factors. Therefore, disease management, nutrient management and proper irrigation are important for reducing the risk of infestation. Janine is a Postdoctoral Research Associate in the Small Fruits and Vegetable IPM Lab. She conducts research and provides education on integrated pest management in fruit and vegetable production.